BMW Repair in Boulder, CO. Book an Appointment Today by Calling (303) 449-8949. Independent Motors is here to help look after your BMW repair and service with an experienced team guaranteed to get you back on the road quickly and safely. Why Trust Us with Your BMW Repair? 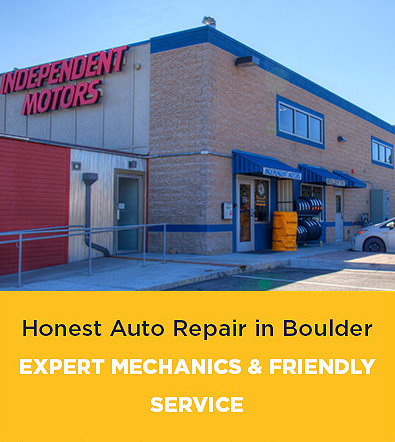 Independent Motors has been in business since 1983 and we are a household name when it comes to auto repair shops in Boulder. People trust us and they admire our passion for quality auto repairs and our commitment to customer service. Moreover, we have many years of experience repairing the full line of BMW vehicles. Need more reasons to trust us with your BMW Repairs & Service? We have over 225 years of combined auto repair experience. We offer state-of-the-art diagnostic software tools that will ensure the best results. We are committed to having your BMW, Mini or Audi back on the road as quickly as possible. Our repair costs are competitive and we work to keep all costs as low as possible. Oil consumption issues with the latest generation of turbocharged engines due to extended maintenance intervals and wear. AC and instrument panel display pixels fading and becoming unreadable. SIA data vehicles are mileage-based with services due approximately every 15k miles/12 months whichever comes first, and based on driving profile/fuel consumption. CBS data vehicles are approximately every 15k miles/12 months whichever comes first. However, given the extreme driving conditions that most customers face, it has been my experience to perform oil/filter services every 5k miles using full synthetic oil as specified by the manufacturer. This also gives the vehicle a chance to be inspected and to catch any upcoming items that may need to be addressed in a timelier manner. Brake fluid flush is recommended by the manufacturer every 24 months, but often times it’s due sooner based on moisture content. Coolant, power steering fluid and other drive line fluids are recommended on an “as needed” basis depending on condition, and BMW/Mini definition of “Lifetime” fluids is 100k miles, or 10 years whichever occurs first. BG high pressure fuel injection services are highly recommended on all vehicles to remove carbon deposits from fuel injectors and intake valves and on vehicles with direct injection for keeping the injectors clean from carbon deposits and residue from low grade fuel. BMW/Mini vehicles are hard on batteries, and having a weak battery can actually cause modules to fail due to the ensuing voltage spikes. BMW is in a class of its own. Every vehicle in its impressive line-up series makes a great first impression and they are all “designed to be as functional as they are beautiful, “like with the “trademark kidney grill” that was developed to reduce drag. At the heart of every BMW is innovative engineering and technology and the company has recently announced that groundbreaking BMW i8 technologies are now available in the BMW line-up. The Valvetronic technology allows engines to breathe more easily and increases fuel economy performance, and every vehicle is loaded with cutting-edge technology: adaptive LED headlights, full-color heads-up display, surround view camera system, night vision, connected driver apps, and efficient dynamics. BMW is also known for offering the best and most advanced safety features and all their vehicles are equipped so that you and your family will be safe while driving anywhere. From state-of-the-art airbags to seatbelt pre-tensioners, to active headrests, you and your passengers have the best protection while on the road. As a BMW or Mini owner you want to ensure that your vehicle is being looked after by a team of highly trained and skilled professionals. Never worry – we have the expertise to address your FAQs. This is why so many BMW and Mini owners rely on us to get the job done right! I think my BMW is overheating. What should I do? A common issue with BMW vehicles is overheating, but don’t worry. There are a number of factors that contribute to this problem, which include a common coolant leak or a water pump that is faulty. What you need to do is meet with a BMW Technician and they will help pinpoint the problem and fix it right away. Keep in mind, if you think your vehicle is overheating, get expert advice right away. If you ignore the problem, it could cost you more money down the road. What does it mean when I see a puddle of oil under my car or smell burning oil while driving? This is a definite sign that your BMW has an oil leak and it needs to be fixed. A leaky gasket or a failing seal is probably the culprit. You don’t want to be driving around town with an oil leak, that’s for sure. The best option is to bring your vehicle to a Certified BMW Technician and they will fix it right away. Remember, an oil leak is very easy to fix. Have it looked after now to avoid further problems down the road! Why does my steering wheel shake and vibrate when braking? This is a very common issue with the BMW 3-series and it simply means that there is something seriously wrong with your thrust arm brushings. It’s important to know that arm brushings are a big part of your suspension system. These rubber units have been known to fail around 75,000 miles. Why am I getting a “Check Rear Lamp/Brake Lamp” message on my dashboard? You are getting this message because there is a bad connection and it has to do with the tail lamp circuit board. Corrosion is what causes the malfunction indicator and this problem is easily fixed and a Certified Technician will have it looked after which means that your wheels will be back on the road quickly. I think I have a problem with my window regulators, so what should I do? Bring your vehicle in and have a BMW Technician inspect it. The regulator might need replacing…or the motor may be failing. If you are experiencing slow moving or immobile windows, have the problem addressed immediately. Call Independent Motors today at (303) 449-8949 for the best BMW Repair, Service & Maintenance in Boulder, CO. You’ll be glad you did!